Wrexham.com has been inspired by the antics of the My Name Is Not Cancer Chicken aka Fiona Fletcher from Bersham, who is wearing a chicken costume for an entire month to raise awareness for cancer charities. 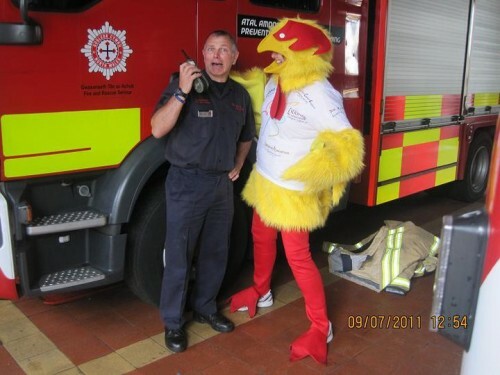 Fiona plans to wear a chicken costume at some point each day throughout the whole of July with a t-shirt featuring the logo of a different cancer charity each day to encourage fundraising for the causes. She is currently on day 10 of the campaign and visited Wrexham Fire Station today to highlight the Everyman Male Cancer Charity. Fiona has already raised awareness for a number of other charities including the Teenage Cancer Trust, Pancreatic Cancer UK and Breakthrough Breast Cancer. Fiona started the not-for-profit group My Name Is Not Cancer following the death of her daughter Megan who battled with Hodgkin’s lymphoma for 16 months before she sadly passed away in May 2010. Fiona is updating her blog on a daily basis and has already had a number of amusing incidents whilst wearing the chicken suit, including a visit to Calon FM’s Trance Show, a trip to Tescos and being asked to reveal her face as she filled up her car with petrol in Sainsburys petrol station. 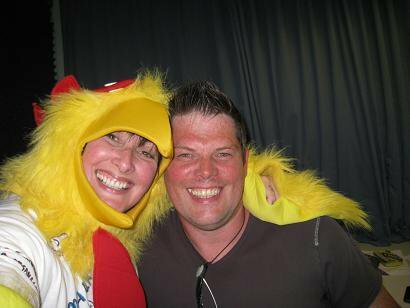 “I went on Calon FM to raise awareness about the campaign and to talk about helping people with cancer retain identity and a sense of self. Fiona told us that if any Wrexham.com followers had a specific charity which they would like her to feature within the 31 days or somewhere they would like her to visit to contact her via Twitter at @Fiona_Fletcher or send your suggestions to us at @WREXHAMdotcom and we will pass them on.